This is a story about friendship. It’s based on events from my childhood: I really did make a cardboard piano for my best friend. Who realized immediately that it was no fun. Which hurt my feelings. After I finished illustrating the story, I got to spend lots of time with a grown-up friend, Chris Allen-Wickler. I cut apart the original artwork, made new pieces, and together we produced a somewhat home-made stop animation DVD that comes with the book. We hope you enjoy both the book and the DVD. Hi there! I am an elementary school music teacher in a public school in South Jersey. I am currently reading this story with my first grade general music classes. After we read, each child is drawing their own “cardboard piano” and decorating it however they like. Next week we will listen to classical piano music while “playing” on our pianos. We will use our cardboard pianos to notice high vs. low sounds and soft vs. loud sounds. 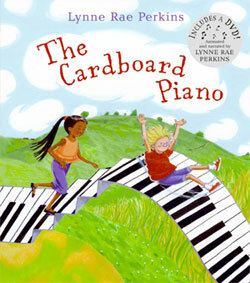 I love how the idea of the cardboard piano stimulates the imagination and hearing music in your head. (audiation) The kids really seem to connect to the story, and can relate to this type of small conflict between friends. Looking forward to watching the DVD with the kids in the weeks to come. Thank you, Miss Manion. It makes me really happy to hear that you are using The Cardboard Piano in this way. And it sounds like a lot of fun! Hello to all!